A Rhode Island woman was killed in a crash on the Maine Turnpike in Kittery. A tractor-trailer broke through a guardrail and crossed the median to collide head-on with the victim’s SUV. The Maine truck accident lawyers of Hardy, Wolf & Downing are hoping police are able to pinpoint a cause for the crash at the conclusion of their ongoing investigation. The accident occurred at 12:30 p.m. on Thursday, September 18. Christine Anderson was driving in the northbound lanes of the turnpike on her way to the Maine summer home she shared with her husband. The 59-year-old Rhode Island woman was hit by the tractor-trailer driven by Daniel Dunlea. Dunlea is a resident of New Hampshire and works for Reas Transportation in Billerica, Massachusetts. He was hauling a load of recycled paper products when the accident occurred. A spokesperson for the Maine Turnpike Authority, Erin Courtney, told the Portland Press Herald that the collision was one of the most severe crashes seen on the turnpike in a number of months. All of the northbound lanes on the turnpike had to be closed two separate times – once to remove Anderson’s vehicle and a second time to remove the tractor-trailer. Drivers experienced back-ups during that time that extended two miles into New Hampshire. The accident is currently under investigation by state police. Officers are looking into whether Dunlea had been under the influence of drugs or alcohol at the time of the crash. They are also investigating whether distracted driving was a factor, or if Dunlea was driving drowsy. Police are also looking into the possibility that a medical condition played a role in the accident, but have found no evidence to support that theory at this time. According to the Maine Bureau of Highway Safety, there were 164 fatal crashes in the state during 2012. There were also 981 serious injuries as a result of traffic accidents during that same year. 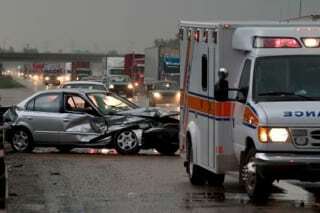 The majority of the fatalities involved either speeding or unrestrained passengers. Alcohol impairment also played a role in a number of the fatal accidents on record. When you are the victim of a vehicle accident, you may be faced with significant medical bills and lost wages due to your inability to work while you are recovering from your injuries. At the same time, you are dealing with the pain and possible disability the aftermath of an accident can bring. During this time, you need the help of experienced Portland ME car accident attorneys who can ensure your rights are protected and you receive all the legal compensation to which you are entitled. Hardy, Wolf & Downing understand how difficult it can be to pick up the pieces after a serious vehicle accident. We will help you pursue damages for medical expenses, lost wages and other non-economic losses, should you have grounds for a claim. Legal issues surrounding vehicle accidents can be complex and nearly impossible to navigate without the help of an experienced professional. Contact us at 1-800-INJURED for a complimentary case evaluation today.